One usually associates trijets, excluding the 727, with ‘heavies.’ On the contrary, “heavies” are seldom associated with La Guardia. Nowadays, during a complete day of spotting at LGA, an aircraft weighing in at 255,000 pounds seems to be a privilege more than anything else. But, as photographers like Howard Chaloner and Art Brett dig deeper into their archives, we are reminded of an age where the McDonnell Douglas DC-10 and Lockheed L-1011 TriStar were the pride and joy of LGA. Lockheed’s L-1011 TriStar and McDonnell Douglas’ DC-10 were initially conceived and designed to compete with each other, but ultimately complimented each other as two of the most unique aircraft to grace the skies. While the rest of the world was covered in a cloud of smoke, concerned with access to Studio 54 and psychedelic tie-die T-shirts, American Airlines was on the hunt for a high capacity, medium range airliner. Both industrial giants, McDonnell Douglas and Lockheed jumped at this opportunity, and started development in much the same way. The two teams originally designed a twin-engine wide body, but research concluded that such an aircraft would not be able to meet existing power requirements with then-present engine technology. With this, the characteristic third engine was developed. Even with the added power, though, some were concerned about the DC-10’s and L-1011’s performance at an airport like La Guardia. Art Brett commented that he remembered seeing the DC-10, and thinking that it was too big for LGA. “Having flow in and out of LGA many times on different aircraft” says Mr. Brett, “I really wondered what the performance [would be like], but there was never a problem.” 7,000-foot runways and weight were just some of the limits to be taken into consideration. However, after all was said and done, these aircraft were a frequent visitor to LGA. The ceremonial first flights of these aircraft occurred within months of each other, however, the DC-10 was flown by an airline nearly a year before its Lockheed competitor. 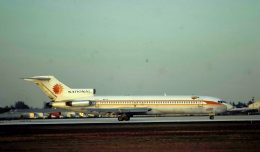 Rolls Royce, the TriStar’s selected engine supplier, announced bankruptcy in the midst of developing the RB211, severely delaying the L-1011’s progress. Financial issues were eventually resolved, and the RB211 proved to be reliable and efficient. 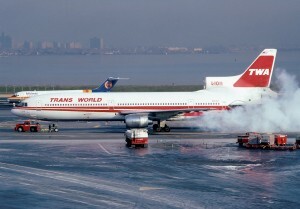 Lockheed’s trijet variant entered service with TWA and Eastern in 1972, a considerable amount of time after American Airlines introduced the first DC-10 into their fleet in 1971. American scheduled services to LGA with the newest additions to their fleet almost immediately after their delivery in 1971. According to Mr. Brett, “The (inaugural flight) was delayed, because a passenger inadvertently deployed the emergency chute. 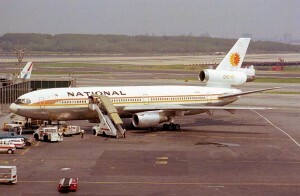 Shortly thereafter, a mechanic left some tools in the intake of an engine, then did an engine runup.” These accidents did not hinder future activities, as over the next five years, United and National Airlines brought their Douglas DC-10’s to La Guardia, followed by Delta, Eastern and TWA’s Lockheed L-1011’s. 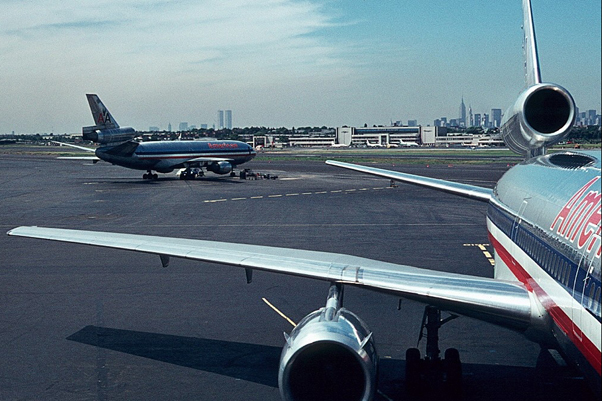 By the mid 1970’s, La Guardia was catering to both of these wide bodies. Right from the beginning, this was beneficial for La Guardia. In simple business terms, bigger equals better. These higher capacity aircraft filled LGA to the brim with the flying public, while collecting higher landing fees from the airlines. Passenger numbers increased nearly five-fold from 1960 to 1980, while the number of actual plane movements increased by only one-third. Both aircraft ultimately spawned into different variants. Douglas developed the original DC-10-10, followed by the -30 and -40, and Lockheed produced the -100, -200, and -500, as well as conversion models like the -150 and -250 to follow the L-1011-1 base model. However, only the DC-10-10, and L-1011-1 were active at LGA. Nowadays, quantity has given way to frequency, as is evident by the hundreds of small flights that now bombard La Guardia. 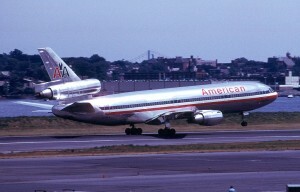 The massive three-holers, specifically American’s DC-10-10s were often used on flights of a few hundred, to a few thousand miles. These large jets were seen as AA563/1170 ferried passengers to/from Raleigh/Durham, NC (RDU) from LGA, a mere 375nm. AA068 was an even shorter hop from LGA to Buffalo, NY (BUF), a 250nm flight that is today flown by American Eagle ERJs and US Airways Express Dash-8s. 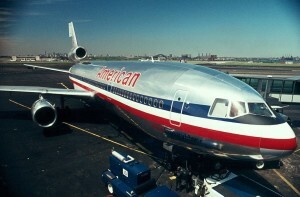 Initially, though, American’s DC-10 flights were destined for either Chicago (ORD) or Dallas (DFW). Eastern and Delta deployed their L-1011-1’s in a constant stream to Boston (BOS), only 160nm away, in addition to Atlanta (ATL), Ft. Lauderdale (FLL), Miami (MIA), Orlando (MCO), West Palm Beach (PBI) and Washington, D.C. (IAD). 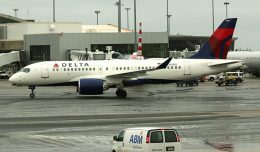 Delta also continued sending their trijets to La Guardia for return trips to places like Atlanta (ATL) through the mid 90’s, and TWA provided runs to Kansas City (MCI) and St. Louis (STL)-which occasionally continued on to Phoenix (PHX). 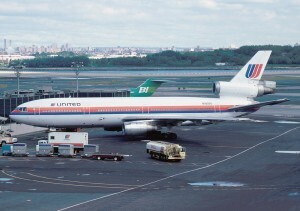 Chicago (ORD) was also served by United’s DC-10-10s, which were also routed to Denver (DEN) on occasion. National Airlines and their own Douglas equipment provided more Florida destinations, like Miami (MIA) and Orlando (MCO). You’re flying to London, and the six hours in an economy seat are the worst in your life. The lady in front of you is snoring with a crying baby in her arms, while the guy next to you took off his shoes to reveal his fungus infection. Art Brett and Clark Palicka experienced somewhat different conditions on their trijet flights, albeit an experience. Clark Palicka was a passenger on board a Delta L-1011-1 in 1996. “[The take off] was loud, and the plane shook a lot,” as he hurtled down the runway at La Guardia on his way to Atlanta. Art Brett details a less enjoyable flight. 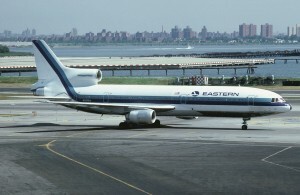 “One of the worst rides I’ve ever had was an EA L-1011 from BOS to LGA. We hit turbulence and must have dropped like a rock for several thousand feet. This guy had just gone into the potty and when he came out he had water splashed all over him.” Hopefully his shirt was blue. Also, National Airlines used aircraft as a means to promote their ‘Fly Me’ campaign. By naming their fleet after women, National hoped to attract more customers. “I remember the National DC-10’s with the girl’s names on them. They were a hit,” adds Art Brett. “I caught Geraldine there one day, and was happy about that.” However, the Woman’s Liberation movement was not as appreciative of this, and deemed it to be degrading to women. La Guardia, up until this point in time, was accustomed to servicing much smaller jets and props. Jetways, as we know them, were yet to be installed. 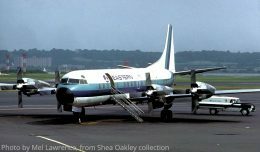 ‘Air stairs’ were the means by which passengers entered and disembarked the aircraft, be it in an old L-188 Electra or a new L-1011 TriStar. 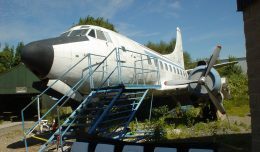 Until the advent of widespread commercial jet travel, and the elimination of slow, insufficient propeller travel, air stairs were the way to go. Up, or down. Since the deregulation of airlines in 1978 resulted in smaller, cheaper airlines, the DC-10-10 and L-1011-1 have slowly been pulled from the limelight. New York Air DC-9s, Air Florida 737-200s, Midway F100s, and the like began to occupy La Guardia. The grandeur of LGA, however, was still there. 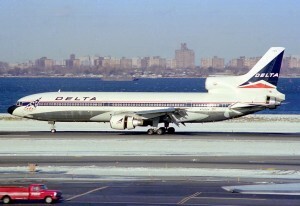 The wide bodies were to be seen over the next 15 years, until Delta was one of the last to remain at LGA with their L-1011-1s. These big boys had quite an extensive reign over northern Queens. For nearly 25 years, the TriStar and its Douglas counterpart soared over Planeview Park, ‘The Dock’, Rikers Island, and the East river. From the early 1970’s through the mid 1990’s, La Guardia truly was a ‘home to the heavies’. Though 16 years old at the time of writing this, Brian Futterman has grown up and become a talented domestic airline First Officer that almost failed high school chemistry because La Guardia arrivals passed right by his classroom window. I’m still flying for business, but I’m so happy I did even more of it when DC-10s and L-1011s ruled the skies out of Boston. I did fly the DL L-1011 from LGA back up to Boston once, but more often found myself on the EA A300s. In any event, these planes (in my view, anyway) were almost the ‘game-changers’ that the 747 was known as. And although this is a NYC site, I’ll just briefly note some of the ‘lesser’ Boston routes that existed with either the DC-10 or the L-1011: Montreal, Hartford, Bermuda, Detroit, St. Louis, Minneapolis and I’m sure others. Those were the days, and I’m proud to say I remember them. Delta regularly flew a 767-400 into LGA until the early oughts. Yep. LGA saw A300s, all versions of the 767, and even a 4-engined 707 and KC-135R for special, non-scheduled flights. But we are only talking about 3-holers here. I wish I could have flown one of the DC aircraft. Sadly, I never made it to one. I was just a young boy when they were being fazed out and the flights I frequented were generally flown by 757’s (which began my love for them) and the occasional 767s. I wish i was still able to see wide-body Tri-Jets flying into LGA… The only big jets I see flying into LGA is the 757 and occasionally the Delta 767-300 on weekends.. Even the 757 is largely gone from LGA if not completely—the services from Atlanta that used to see the 757 for Delta have now largely been replaced by their new 737-900ERs. Was this written about 10 years ago? Somewhat ironic that I’m quoted in an article about 3-holed jets as a kid, and now fly the DC-10! I have flown on the DC-10 DFW to/from LGW, and it was pretty cramped. 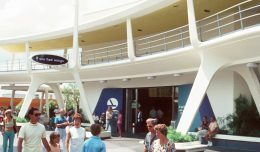 I flew on a Delta L-1011 from ATL to MIA, and remember how much it seemed to shake and twist (center galley frame moving with respect to the ceiling), especially when on short final the PIC initiated a go-around, giving us an intimate view of the terminal building’s roof as we banked over it!… I never found out why. Thanks to some very nice people, I got to fly a 6-axis CAE DC-10-15 sim for just under an hour, and later a B727-200 sim for 8 hours over 5 visits! That was the most fun I’ve ever had, as someone who had never flown anything bigger than a Piper Cherokee Six-300hp. but do the armrests go up? ?